Who doesn’t like to do online shopping? Who doesn’t like to save money on shopping? What if I told you that you can achieve both these things with one such amazing site which offers you cashback while you shop online. As of now, almost every other person in USA has a smartphone and almost 90% of them do online shopping. Did you know that you could get a cashback on every online purchase that you make? Ebates is a website that helps you earn cashback on purchases that you make when you shop online. You can also get a variety of coupons and promo codes on products from your favorite online stores like Amazon, Ebay, Walmart and many others. In this article, we have covered a detailed and honest review about Ebates. We will cover all the pros and cons of Ebates and also answer the burning question “Is Ebates a Legitimate or Scam?” We will be covering all of these points in this article. Also, make sure that you Bookmark my website “ifoundwork.com” as I continuously publish articles on “Legitimate Ways to Make Money Online”, ways to save money and much more. So without any further delay let’s begin the Ebates review by an actual shopper, that’s me! Is Ebates really Legitimate or Another Scam? Is Ebates Really Worth Your Time? Hopefully, by the end of the article you will be in a better position to make a decision whether to give Ebates a try or not. Ebates is one of the best sites (they also have an app) which helps you to save money while you do online shopping. Ebates connects savvy shoppers to America’s biggest brands and retailers and claims to provide them a hassle-free way to save money on the things they buy. Ebates is one of the largest free-membership loyalty programs in the US with an A+ rating from the Better Business Bureau. This website has been around since 1998. 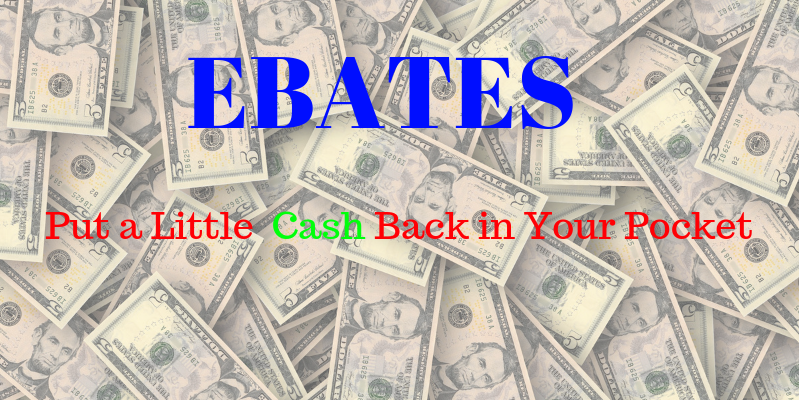 Ebates is a household name in the cashback and rebate industry. It is one of the most successful and most widely used cashback site on the globe which allows you to get around 40% cashback from over 2000 online stores. According to a stat, 65% of the online users around the globe are parts of various reward programs. I have been an user of Ebates since 2016 and Ebates is one of the my best options to save some extra cash. Using Ebates is easy, all you have to do is click on their link for the retailer you want to shop from like Amazon, Kohls, Walmart, Groupon and many others and then shop as you normally do. Ebates has created a system by partnering with over 2,000 major online retailers to refer customers via their links. Whenever you buy a product through the Ebates’ site they get a commission for the qualified purchased made through their link, and then they give a share of the commission in the form of cashback to you. How to Get Notified of the Discounts Available Every Now and Then? Ebates also offers a Chrome extension which notifies you about the various discounts, coupons and promo codes that are available from time to time, all that you have to do is, install this extension. This handy extension will notify and alert you if you are eligible for a cashback while shopping online. You can make some more extra money by referring your friends to Ebates. Currently, Ebates is giving you $25 to every friend you refer who makes a purchase of $25. The earnings that you accumulate are paid on a quarterly basis. See the below for the payment schedule. 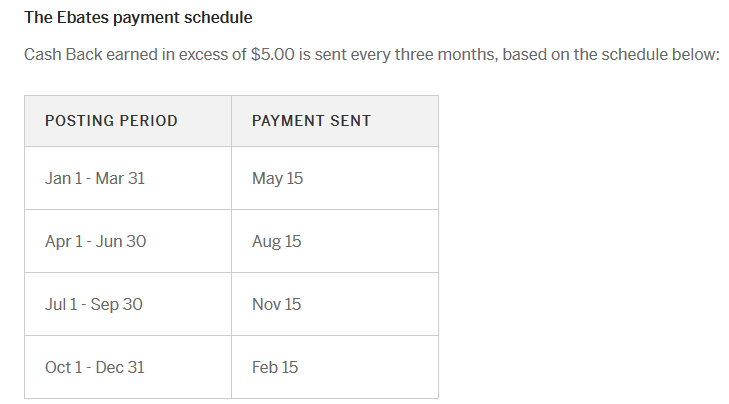 You can request to get paid via check or Paypal whenever your balance is over $5. Some of my favorite Ebates-eligible stores are Kohl’s, Lowes, Ebay, Expedia, Walmart, Staples and Amazon. Ebates platform is not limited only to Desktop, it also has its own interactive Ebates App which can be used on your Android, iPhone or iPad. Ebates is very easy to sign up and the best thing is, that it’s not only Free to Join, but they give you a $10 signup bonus. This in my opinion is one of the easiest ways to make money online. So here’s my final verdict for Ebates, Should you go and try out Ebates? Yes, It’s worth giving a try to Ebates, as you will end up saving that much needed cash which you would have otherwise left on the table. Apart from Ebates, there are many other legitimate ways you can make money online, there are several Legitimate apps which can be used to make money online such as Swagbucks, and I will be covering all the Legitimate Money Making Apps in a separate article. Besides the above mentioned ways you can also make money using high paying survey sites which pay you for taking surveys and expressing your opinion. I will be covering this in a separate article. 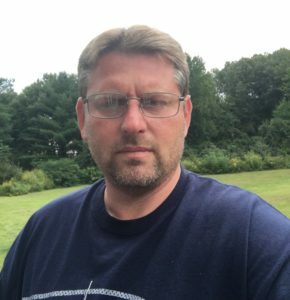 So stay tuned and bookmark my website so that I can serve you with the Best articles from the field of Internet Marketing, Making Money Online, Affiliate Marketing and much more. Looking forward to see you in the next article. Meanwhile, if you enjoyed reading this article please do share it with your friends so that they also benefit from this. Happy Earning to all my readers! !